Journey is an atmospheric mood piece with a retro pop-jazz feel to it. Here’s my fanciful take: the Theremin (beloved of old sci-fi films) takes us initially to a forbidden planet where Robbie the Robot might at any moment burst out from behind a rock. A couple of motifs of romantic longing from the Theremin, with the piano echoing them, then beam us back to a film-noirish earth. We arrive in an Edward Hopper painting in the wee small hours of a sleepy Gotham. A morose Frank Sinatra, his girl having ditched him, sits at the other end of the bar with his only-the-lonely drink. Journey‘s middle section gets more animated and inventive but the mood lingers just as hauntingly. There’s a great piano riff that suggests a startled cockroach scampering across the floor. Despite the eerie elements, the work overall keeps to a mood of wistful reverie. The scale is at once intimate and infinite. Gernot Wolfgang knows what he’s doing. (Even if I may be off base in my response). Theremin’s Journey is mixture of old electronics, new media and traditional piano with more than enough incident to transcend its vernacular idiom into something very cool, clever, and seductive. Theremin’s Journey (2010) by Gernot Wolfgang was first, and this began a low rumble of processed sound accompanied by bell-like chimes that was soon joined by the theremin. The distinctive sound of the theremin is invariably linked with 1950s science fiction movies, but in this piece the alien, otherworldly sound connected nicely with the underlying electronics, even when the theremin was dominating the texture. 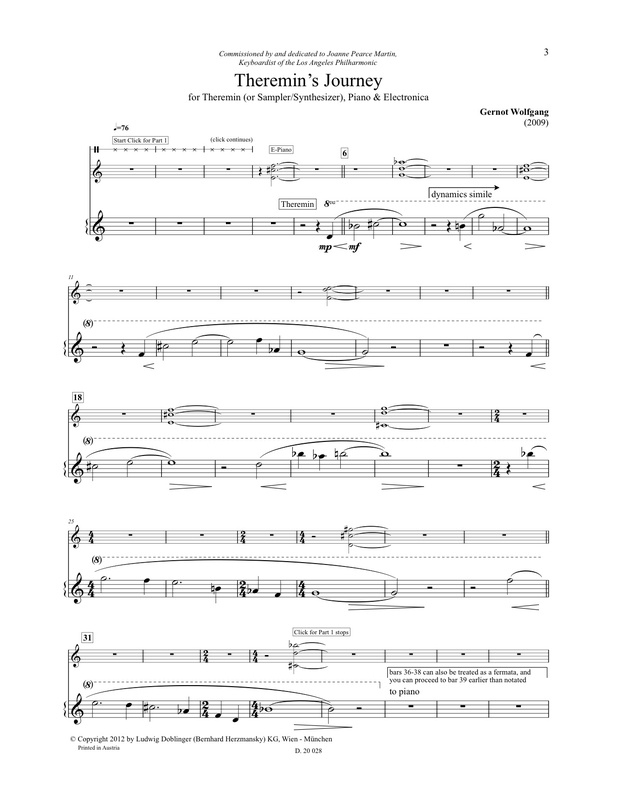 The sound of the theremin was an integral part of this piece and not simply a stylistic effect. Joanne Pearce Martin provided solid control over the pitch and entrances of the theremin and her virtuosity was all the more evident when she switched to the piano as the piece progressed. Theremin’s Journey proceeded in this way, with Ms. Martin alternating between piano and theremin. 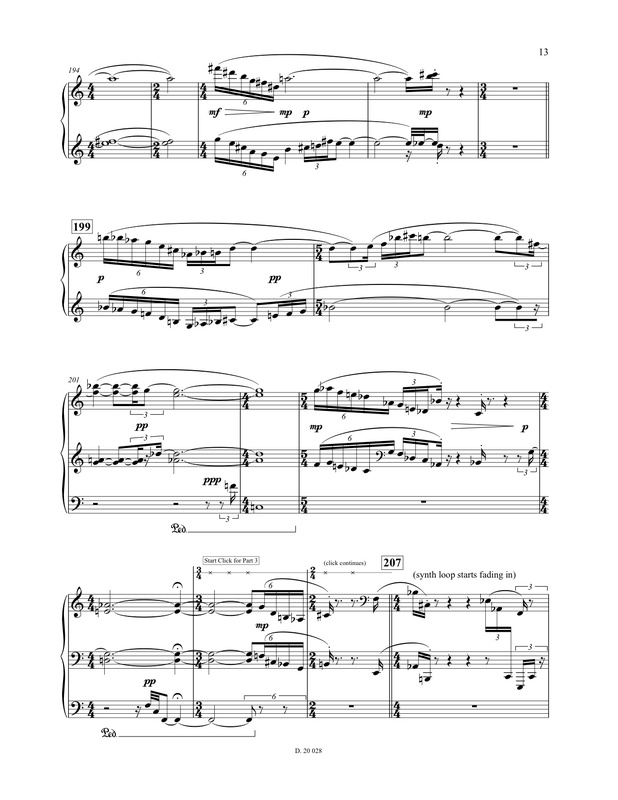 There was a more familiar feel to this piece when the piano was heard, and a sense of movement and energy was provided by several fast runs and short bursts of phrases. At other times the piano was unaccompanied, or gentle and reflective. By contrast, the sections featuring the theremin typically had a distant and sometimes lonely feel. The balance between the various elements – electronics, piano and theremin – was remarkable and the playing was controlled and consistent. Theremin’s Journey could have easily failed on several levels – technical issues, performance difficulties or by simply sounding cliché, but this high-risk piece came off successfully and convincingly on its own terms.